These are just SOME of the stories and articles in this                                      Editors. Diminished Value Of Truth And Intelligence. Page 43: Why Do People Listen To Alex Jones Infowars’ At All? We Asked Them. commencement. Page 49: Who Believes In Conspiracies? Now Research Offers A Theory. 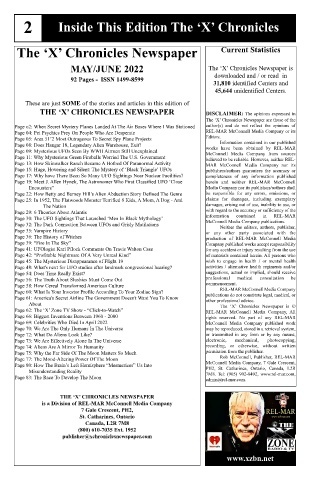 Page 66: Faking Reality: Why People Embrace Conspiracy Theories                                 permission from the publisher. Page 79: The Human Toll Of Policing The Internet From The Worst Of Humanity. Page 81: Why Does The U.S. Flag On The Moon Have Ripples? Page 82: Navy Pilot’s 2004 UFO. A Comedy Of Errors. Page 85: The ‘Mandela Effect’ And How Your Mind Is Playing Tricks On You. Page 86: Conspiracy Theorists Convinced Earth Is Hollow And Filled With Aliens. Page 90: 12 Crazy Conspiracy Theories That Turned Out To Be True.